I recently finished reading the book “The Knitting Circle” by Ann Hood. All of the characters in the book have dramatic stories of loss and grief. The main character, Mary, is struggling to get through her days after the sudden death of her five year old daughter, which is the same tragedy the author experienced and which provided the inspiration for the book. When Mary can barely function, and can’t concentrate to read, write, or work, her mother suggests that she take up knitting. She tells her daughter, “There’s something about knitting. You have to concentrate, but not really. Your hands keep moving and moving and somehow it calms your brain”. When Mary joins a knitting circle, a fellow knitter tells her she will finish her scarf in a couple of days: “That’s how it is at first. You knit to save your life”. For several years, I was a daily knitter. Some of the virtues of knitting are the portability, and creating useful items while working with beautiful yarns. As I get older, I especially appreciate that unlike other crafts and needle arts, neither good lighting nor good eyesight is at all necessary to knit. After reading this book I asked myself if I took up knitting “to save my life”. While I can’t make such a dramatic claim, when I think back I do remember that it was a time of anxiety for me. My mother, who I had taken care of, had passed away, and I was changing my life, taking classes, and ultimately looking for a new job. During these years, I took my knitting with me to hospital and doctor office waiting rooms, as well as in social situations. Knitting very well could have been a type of therapy – meditative, soothing and rhythmic, using hands and mind together in harmony. Crocheting, the sister yarn art to knitting, provides a similar experience. One of the things I like about knitting is that you work the stitches as you come to them, passing the stitches from one needle to the other, while in crochet you have to see where to put the hook. I’ve knitted sweaters, hats, and scarves, but living in Southern California, even during some winters (like the current one with temperatures in the 70s and 80s) I don’t need those warm, cozy items. 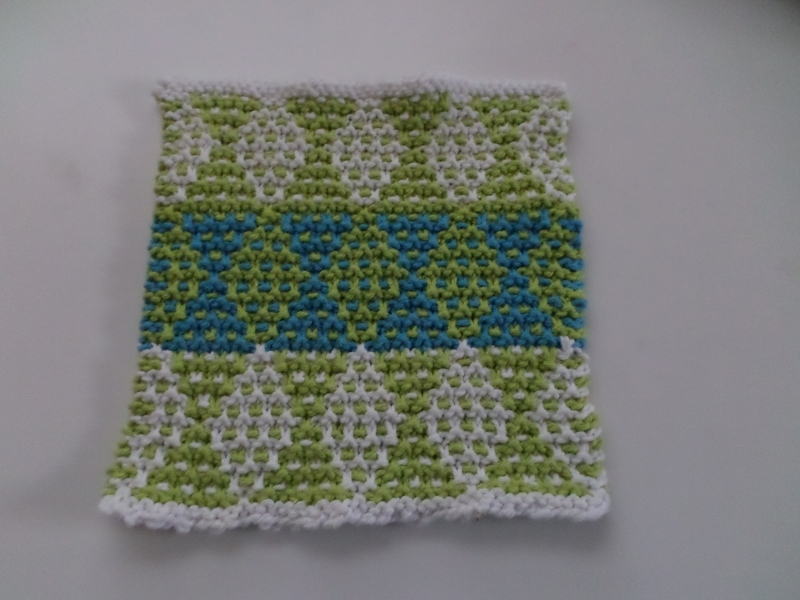 So one thing I enjoyed knitting was dishcloths – small projects on which I could try different patterns and techniques. Among those pictured are the basic and popular grandmother’s favorite dishcloth, ballband dishcloth, and the chinese waves dishcloth. 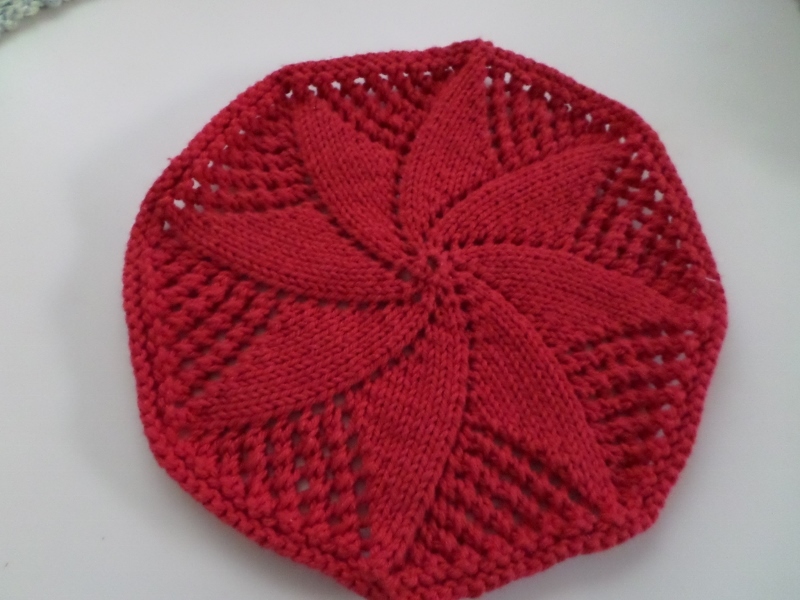 I knit the pretty doily style dishcloth from the inside out on two circular needles. 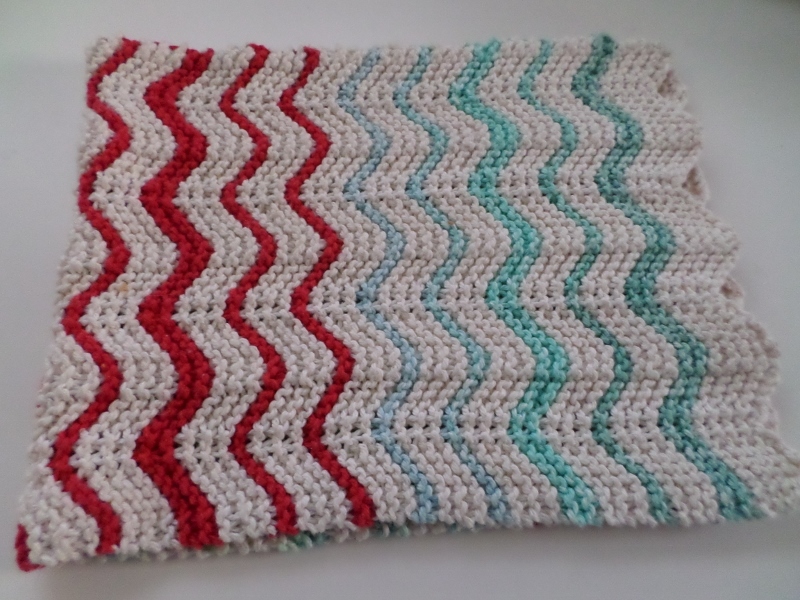 And I loved knitting the slip stitch pattern of the linoleum dishcloth. 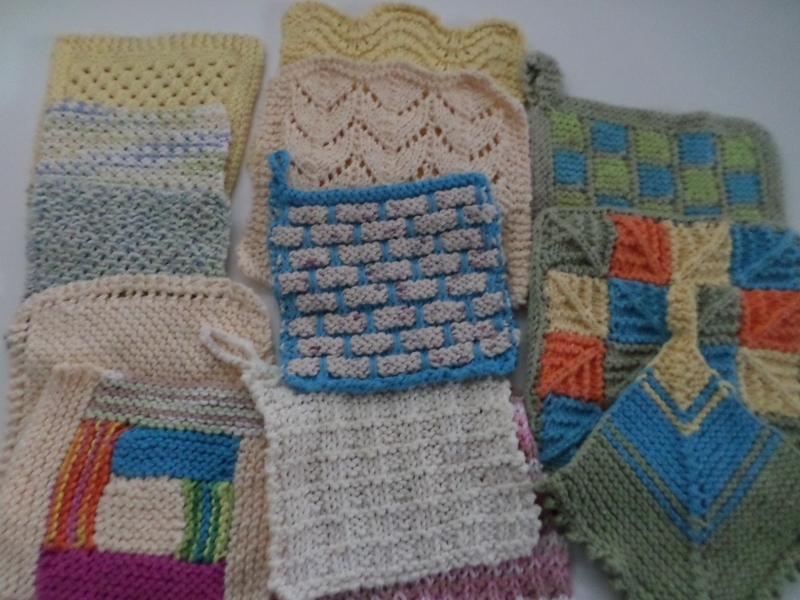 While I enjoyed the process of knitting dishcloths, I don’t use them to wash dishes. I decided to knit bigger versions to use as my kitchen towel on the oven handle. I took out my circular needles to knit up the soft cotton knit dishcloth from The Purl Bee. 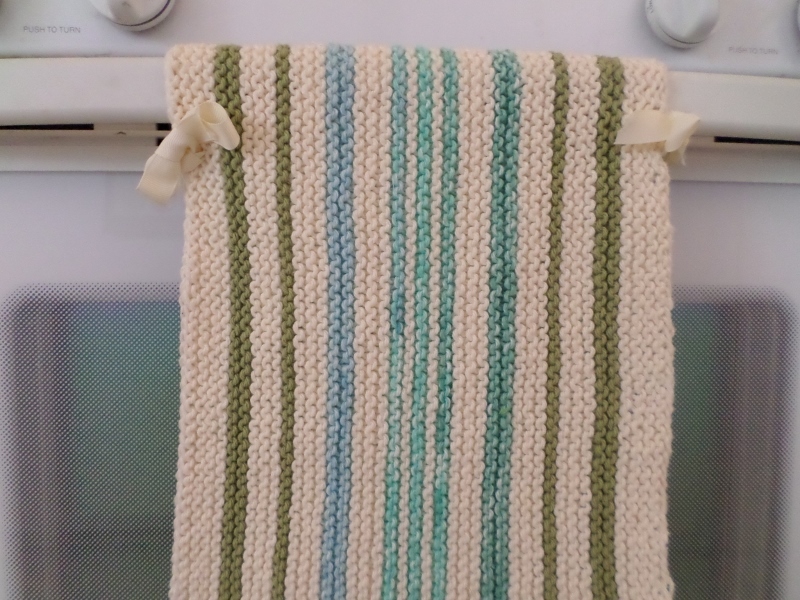 I loved the simplicity of knitting simple garter stitch with the added element of stripes. 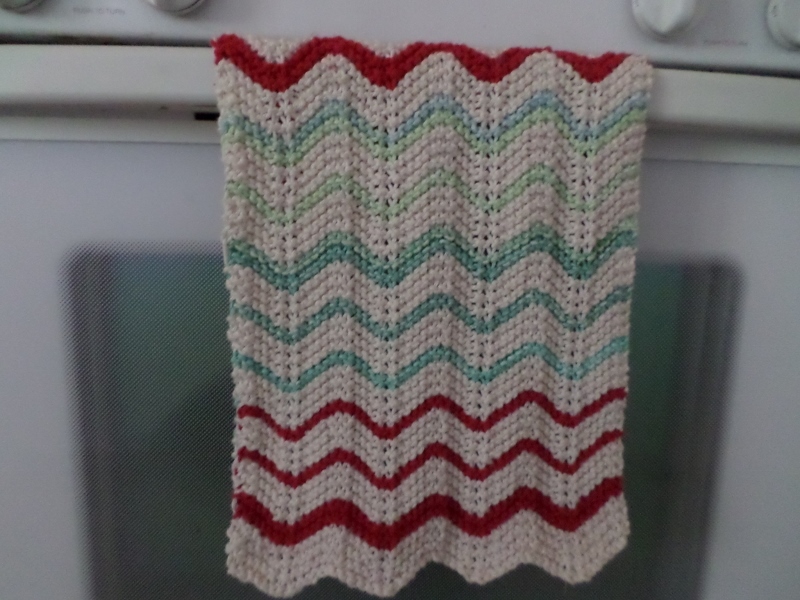 For the second towel I used the chevron stripe pattern found in this baby blanket. The two row pattern uses a multiple of 14 plus 2 stitches. For those who knit, what do you like about it and what places have you taken your knitting? Has knitting, or another needle art or craft, “saved you” from a hard time in your life, or helped you through a situation? This entry was posted in Books, Knitting and tagged knitted dishcloths, knitting as therapy, The Knitting Circle by Ann Hood on February 26, 2015 by Stitch It Again. And once you get started, knitting becomes addictive. It is great for getting through waiting situations, while accomplishing something at the same time. I don’t knit but I definitely agree that handwork can be soothing and calming in times of trouble. You describe the benefits very well here! There have been studies about the health benefits, and I bet it applies to other crafts as well. I knit because I love fibres, and since I work with them professionally in other ways, yarn was a different way to stay in touch with my addiction and get to call it a hobby… Although I will admit it sometimes get a little out of hand and all I want to do is finish that project instead of focusing on proper work! That may be a downside: working on a craft instead of tackling work or chores that need to get done. I make lists to try to keep myself on track. My mother used to always say that if someone felt down that they should do needlework. I’ve never heard anyone else ever say that. It’s interesting that the mother in the novel also tells her daughter to take up knitting. I think it’s good advice, maybe it worked for your mother and she was passing on her experience. The author did take up knitting, but I don’t know if her own mother suggested it, or if that part was a literary invention.